We’d love your help. Let us know what’s wrong with this preview of Making Bombs for Hitler by Marsha Forchuk Skrypuch. Lida thought she was safe. Her neighbors wearing the yellow star were all taken away, but Lida is not Jewish. She will be fine, won't she? But she cannot escape the horrors of World War II. Lida's parents are ripped away from her and she is separated from her beloved sister, Larissa. The Nazis take Lida to a brutal work camp, where she and other Ukrainian children are forced Lida thought she was safe. Her neighbors wearing the yellow star were all taken away, but Lida is not Jewish. She will be fine, won't she? Lida's parents are ripped away from her and she is separated from her beloved sister, Larissa. The Nazis take Lida to a brutal work camp, where she and other Ukrainian children are forced into backbreaking labor. Starving and terrified, Lida bonds with her fellow prisoners, but none of them know if they'll live to see tomorrow. When Lida and her friends are assigned to make bombs for the German army, Lida cannot stand the thought of helping the enemy. Then she has an idea. What if she sabotaged the bombs... and the Nazis? Can she do so without getting caught? And if she's freed, will she ever find her sister again? To ask other readers questions about Making Bombs for Hitler, please sign up. How can I read. This. Online? How can I read this for free online? Marsha I would hope you wouldn't try, because that's theft. If you cannot afford to buy it, you can take it out of the library. "Making Bombs For Hitler" by Marsha Forchuk Skrypuch will take you into a world that you could never imagine was real. How could such cruelty to fellow human beings exist? Although, "Making Bombs for Hitler" is a fictional account of young Lida's survival in the Nazi camps, it is based on historical facts and stories gleaned from those who actually survived those times. As I read through the pages, I was numb. I could not even shed a tear, I was so angry at the inhumanity that was brought on by w "Making Bombs For Hitler" by Marsha Forchuk Skrypuch will take you into a world that you could never imagine was real. How could such cruelty to fellow human beings exist? Although, "Making Bombs for Hitler" is a fictional account of young Lida's survival in the Nazi camps, it is based on historical facts and stories gleaned from those who actually survived those times. As I read through the pages, I was numb. I could not even shed a tear, I was so angry at the inhumanity that was brought on by war. We sit in a country that is peaceful, where no matter how poor we are, there is still something on our plate at mealtime that resembles actual food. The one thing that kept crossing my mind, though, as I read what Lida experienced, was, how many nine year olds today would even know how to survive such devastation. Let us pray they never have to. Let us pray that any person who picks up this book and reads it, will think twice about the glories of war, for in war, there is really no glory. This book tells the story of Lida, a fictional young Ukranian girl, who is captured by the Nazis to be used for slave labor shortly before her ninth birthday. Lida's father was killed by the Soviets, and her mother was shot by the Nazis for attempting to hide their Jewish neighbors. After that, Lida and her beloved younger sister, Larissa, went to live with their grandmother, where they were captured by the Nazis. The girls were separated, with Lida being sent to a work camp. Lida is devastated, This book tells the story of Lida, a fictional young Ukranian girl, who is captured by the Nazis to be used for slave labor shortly before her ninth birthday. Lida's father was killed by the Soviets, and her mother was shot by the Nazis for attempting to hide their Jewish neighbors. After that, Lida and her beloved younger sister, Larissa, went to live with their grandmother, where they were captured by the Nazis. The girls were separated, with Lida being sent to a work camp. Lida is devastated, as she doesn't know what happened to her sister, her only remaining family, and she fears she might have been harmed or killed because she is too young to work. The conditions at the work camp are awful. Lida lies about her age, hoping she will be seen as more useful, and thus, be kept alive. There is never enough food and everyone is cold and hungry. Lida is lucky, because she is given a good position working in the laundry, which is clean and warm. However, after a few months, she is forced to go to work in a factory, making bombs for the Nazis. Lida hates having to help the Nazi war effort, because if they win, she will never be free again. However, she is able to find comfort from memories of her family, from her friendship with other children living at the camp, and from keeping alive her hope that one day she will find her sister again. Reason for Reading: The author has become one of my favourite Canadian juvenile authors. This book is a companion to 2010's Stolen Child. Each book tells the fate of two Ukrainian sisters as they are separated in the middle of WWII. The books need not be read in any particular order. Making Bombs for Hitler details what happens to the eldest sister, Lida. The first couple of pages describe her parting from the younger sister, which is told in much more detail in Stolen Child. Lida is then sent to Reason for Reading: The author has become one of my favourite Canadian juvenile authors. This book is a companion to 2010's Stolen Child. Each book tells the fate of two Ukrainian sisters as they are separated in the middle of WWII. The books need not be read in any particular order. Making Bombs for Hitler details what happens to the eldest sister, Lida. The first couple of pages describe her parting from the younger sister, which is told in much more detail in Stolen Child. Lida is then sent to a Nazi slave labour camp where many Ukrainians were herded and sent to for the duration of the war. Since the Ukraine, at the time was part of Russian territory, the Nazi's labeled all Ukraines as Russians and thus as enemies at this time in the war. The Ukrainians (Russians) were the lowest of the low in prison camps and treated the worst of the worst. بعد از اینکه والدین و مادربزرگش رو در سال 1943 از دست داد، لیدا ی 10 ساله از خواهر کوچکترش لاریا توسط نازی هایی که اکراین رو اشغال کرده بودن، جدا شد و اونو به اردوگاه کار منتقل کردند. اما لیدا اونجا متوجه میشه که چقدر میتونه قدرتمند باشه. لیدا و چند نفر دیگه رو برای کمک به ساخت بمب های هیتلر منصوب میکنن اما لیدا تمام تلاشش رو میکنه تا بمب ها رو دستکاری کنه. نویسنده توصیفات خوبی از شرایط رو که نشان دهنده بی ارزشی جان انسان ها در اون زمان و سختی شرایط زندگی بوده، نشون میده. طراحی نثر هم طوری بود که بعد از اینکه والدین و مادربزرگش رو در سال 1943 از دست داد، لیدا ی 10 ساله از خواهر کوچکترش لاریا توسط نازی هایی که اکراین رو اشغال کرده بودن، جدا شد و اونو به اردوگاه کار منتقل کردند. اما لیدا اونجا متوجه میشه که چقدر میتونه قدرتمند باشه. لیدا و چند نفر دیگه رو برای کمک به ساخت بمب های هیتلر منصوب میکنن اما لیدا تمام تلاشش رو میکنه تا بمب ها رو دستکاری کنه. نویسنده توصیفات خوبی از شرایط رو که نشان دهنده بی ارزشی جان انسان ها در اون زمان و سختی شرایط زندگی بوده، نشون میده. طراحی نثر هم طوری بود که در انتها همچنان عنصر امید رو برای خواننده باقی می گذاشت. تقریبا پرسیدن سوال اینکه اگه ما جای لیدا بودیم چه کار میکردیم، غیر ممکنه. Wow. I can see why my kiddos have all been coming up to me with this book in their hand saying "Ms. Stewart, you HAVE GOT to read this!" They've been reading Number the Stars & The Boy in the Striped Pajamas in their reading class, so when this one appeared at the book fair last week, it flew off of the shelves as fast as the librarian could restock it. In just the few days it's been around, it has had quite the rapid circulation rate as it is read, borrowed & lent, and read again. I was Wow. I can see why my kiddos have all been coming up to me with this book in their hand saying "Ms. Stewart, you HAVE GOT to read this!" They've been reading Number the Stars & The Boy in the Striped Pajamas in their reading class, so when this one appeared at the book fair last week, it flew off of the shelves as fast as the librarian could restock it. In just the few days it's been around, it has had quite the rapid circulation rate as it is read, borrowed & lent, and read again. I was finally able to get my hands on a copy and was informed that I was NOT to wait on reading it. So, at the insistence of my children, I sat down tonight and read it. They were not wrong. This is a fabulous book. It was a good book to read because at the end Lida revives a letter from her lost sister and it was very emotional when I read it. None of the school libraries in our town could keep this book on the shelves during our spring book fair. The students were drawn to the title and the excellent video trailer from Scholastic. They kept reading because this is an engaging story, told well. They finished with heavy hearts and new knowledge. I read quite a bit of young adult and children's holocaust literature. (See this review for a list of great books.) I was so glad to read another well-written book on this topic. I was even mor None of the school libraries in our town could keep this book on the shelves during our spring book fair. The students were drawn to the title and the excellent video trailer from Scholastic. They kept reading because this is an engaging story, told well. They finished with heavy hearts and new knowledge. I read quite a bit of young adult and children's holocaust literature. (See this review for a list of great books.) I was so glad to read another well-written book on this topic. I was even more excited to discover that it is actually a companion book and I have more to read. One of the things I was impressed with was that Skrypuch dealt with the horrors of labor camps and Nazi atrocities unflinchingly, but was somehow mindful of the youth and innocence of her intended audience. In reading books like this one, young readers can understand what happened without being overwhelmed. I think this is important for a first introduction to a hard topic. If a reader becomes too horrified, they just shut down and avoid the topic from then on. If a reader sees the ugly, "feels" a bit of it, but is given some breathing room, most come to accept the bigger truths of pain and suffering and cruelty, and can go on to learn from it. Making Bombs For Hitler is just such a book. Making Bombs for Hitler is the story of eight-year-old Lida, a Ukrainian child who is captured and enslaved in a German camp during WWII. There, she is starved, abused, forced to work long hours and reminded daily of her sub-human status. In spite of all these things, Lida's spirit remains strong. She fights off despair by looking for glimmers of good in her circumstances, and is a model of selflessness and hope to those around her. Another inspiring story from Marsha Forchuk Skrypuch. A possible theme is no matter how hard something is you can over come it. Lida overcame many challenges by being sent to work camps and only eating turnip soup. The hardest challenge was losing her sister and she knew she would have to work hard to get her back. Lida works hard throughout the book by making tough decisions and back breaking work. Ukrainian Canadian author Marsha Skrypuch writes--as one interview said--"War Fiction: Writing the stories that haven’t been told." She writes about genocide and displaced persons with an eye toward well-researched historical detail often given a personal touch through interviews with survivors who lived through the very stories her fiction brings to readers who often begin each book with little or no knowledge about the stories that have been covered up, overlooked, or allowed to fall through t Ukrainian Canadian author Marsha Skrypuch writes--as one interview said--"War Fiction: Writing the stories that haven’t been told." She writes about genocide and displaced persons with an eye toward well-researched historical detail often given a personal touch through interviews with survivors who lived through the very stories her fiction brings to readers who often begin each book with little or no knowledge about the stories that have been covered up, overlooked, or allowed to fall through the cracks of our baseline knowledge about man's inhumanity to man because fictional and historical accounts often focus on politics and battles rather than on those who suffered. In "Making Bombs for Hitler," Skrypuch--author of twenty books for young people--focuses on the Nazi practice of rounding up Polish, Ukrainian and other children and using them as slave labor in work camps on behalf of the Reich. Those who were too young or too infirm to be productive were eliminated. Some were drained of blood that was sent to the front for use by wounded German soldiers. Others, like the novel's protagonist, Lida, were forced into camp jobs, rented out to local farmers and others, or pressed into factory work. While Lida is a strong character, she is a child as are the others in her cold barracks room. So, young readers will be able to identify with her fears and concerns, including her worry about the fate of her younger sister who was taken somewhere else. Those sent to the bomb making factory are caught between their will to survive and the morality of making weapons for the Nazi war machine. It's difficult to read this without wondering "As a twelve-year-old child, what would I do under similar circumstances." I really liked this Book although it was sad it was very interesting and I couldn't put it down.I liked how it was told in Lida's point of view.I would get the other books. As others have said, I couldn't put this book down. Characterization and tension were strong. I had to keep a box of tissues nearby. It was hard to believe the Larissa's maturity, but maybe this is what happens during extreme trauma. 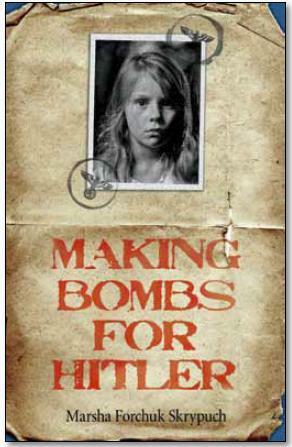 Making Bombs for Hitler is a fictional account of a young Ukrainian girl who is captured by the Nazis for slave labor. It is a heartbreaking story of survival and resilience and how in such horrible circumstances a bond of humanity and selflessness can be found. The book is written for middle school and up but is a fascinating read for adults as well. This is a story from the perspective of a child that was put in a concentration camp. Lida loses her parents and is transported to a camp with her sister, but then her sister gets taken away. Lida gives specific details of the food, clothing, and lives of everyone there. Very inspirational book that explains how even when you are at the lowest you can still help others. A coworker's students have been reading this book. On a whim, I purchased it. I have been interested in WWll stories since I was a kid. This book told a riveting story that was so sad, but kept me wanting more. As a teacher, students in 5th and up would learn a great deal from this novel. I only read this because I was waiting for a book to arrive, but I actually ended up liking it a lot! I would rate it a 3.6, but more of an "I like it" than "I really liked it". I actually learned a bit from this book about the Holocaust and what it was like for those in it, and it was a really nice quick read that progressed nicely and was very interesting to read. I would recommend it to others if they want a short read, and I must say that it was pretty good! Some of my favorite books are the ones my children get excited to share with me. This was a great book to open up discussion with two of my kids. They flew through this book and waited patiently for me to get through the book so we could talk about it. I will definitely read and hopefully share more books from this author with my children. Very inspiring and really makes you think and be more greatful for your situation, even if you feel like life is hard and unfair. My 12 year old daughter got this book for Christmas and really enjoyed reading this bit of history and finished it in 2 or 3 days. She then told me that I had to read it as well. It was interesting reading about this war from a child's perspective. Me and my daughter both really enjoyed this book. I thought it was a good book for a younger audience about the tragic heartbreak of WWII. My kids read it without putting the book so wanted to read. Well written! Intense and sad. Historical event written well. Marsha has received numerous awards and honours for her picture books and young adult novels, including a nomination for the Canadian Library Association Book of the Year in 2007. Marsha has penned the bestselling Dear Canada book, Prisoners in the Promised Land. In 2008, Marsha was awarded the Order of Princess Olha by the Ukranian President, in recognition of her story, Enough, which described th Marsha has received numerous awards and honours for her picture books and young adult novels, including a nomination for the Canadian Library Association Book of the Year in 2007. Marsha has penned the bestselling Dear Canada book, Prisoners in the Promised Land. In 2008, Marsha was awarded the Order of Princess Olha by the Ukranian President, in recognition of her story, Enough, which described the great Ukranian famine that claimed millions of lives in the 1930s.